← SCOTT SISTERS TO BE FREED! 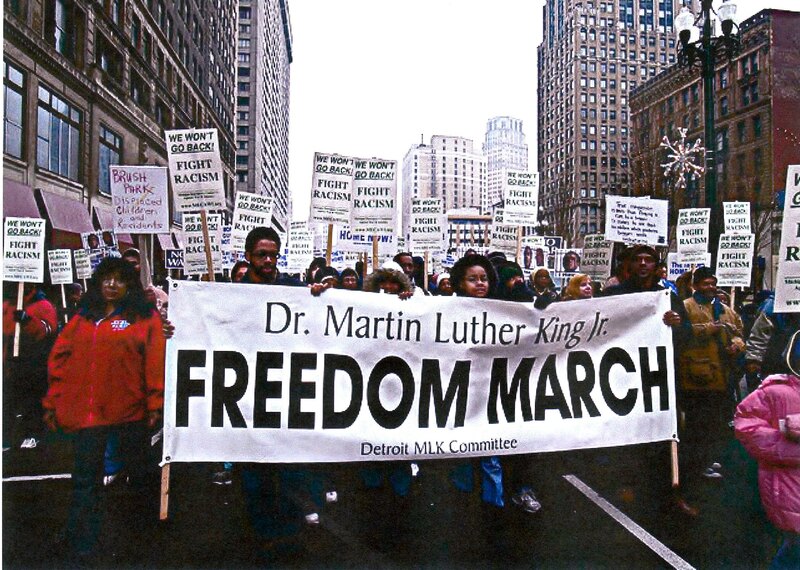 Dr. Martin Luther King, Jr. would have organized mass rallies in support of human rights for prisoners across U.S.
WHAT WOULD DR. KING SAY OR DO? The Concerned Coalition to Protect Prisoners Rights is expected to request to visit at least one more Georgia penal institution before the year ends to continue its fact finding process. Coalition spokespeople have been deluged with messages of solidarity and support from across the country and around the world. Meetings, marches and demonstrations have taken place in Oakland, Detroit, and New York and elsewhere . The Center for Constitutional Rights and other outfits are circulating online petitions which have garnered thousands of signatures in support of the prisoners. Those wishing to contact the Coalition via email can do so at concernedcoalitiong@gmail.com. 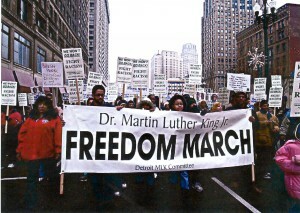 In about three weeks we’ll all be celebrating the January 15 anniversary of Dr. Martin Luther King’s birth. Many have remarked on the great distance between the actual life and work of Dr. King and the empty plaster saint of nonviolence that some have turned him into. The truth is that the living Martin Luther King was a fearless opponent of injustice, a man unafraid of endorsing unpopular causes, so long as these causes were just. 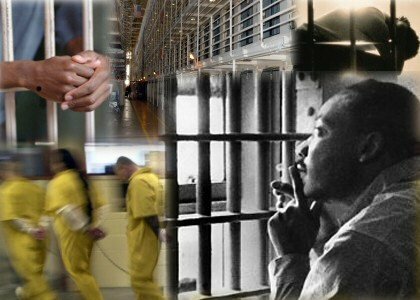 If Dr. King were alive today he would wrap his arms around the cause of Georgia’s and this nation’s prisoners. Work without wages is indeed close to slavery. Even if the 13th Amendment permits “involuntary servitude” of those convicted of crimes Dr. King might rightly observe, that this was passed almost a century and a half ago, and that many things “legal” are neither moral nor advisable. The U.S. has four and half percent of the world’s population and nearly twenty five percent of its prisoners. Georgia leads the nation with an astounding one in thirteen of its adult citizens in prisons and jails, or under court and correctional supervision, thanks to innovations like the privatization of misdemeanor probations. When advocating ever-longer sentences becomes a standard campaign tactic for ambitious politicians, when fortunes are made overcharging inmate families for phone calls and raking off ten percent and more of paltry funds families send their loved ones, when prisons become growth industries with their own lobbyists, punishment has become a crime. 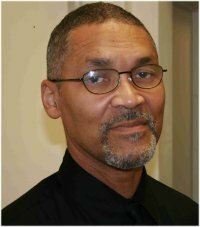 Bruce A. Dixon is managing editor of Black Agenda Report and a member of the state committee of the Georgia Green Party. He can be reached at bruce.dixon@blackagendareport.com. Go to http://georgiasolidarity.tumblr.com/post/2391556284/the-strikers-will-be-heard-georgia-abolition-rings-in to see video of DC confrontation. 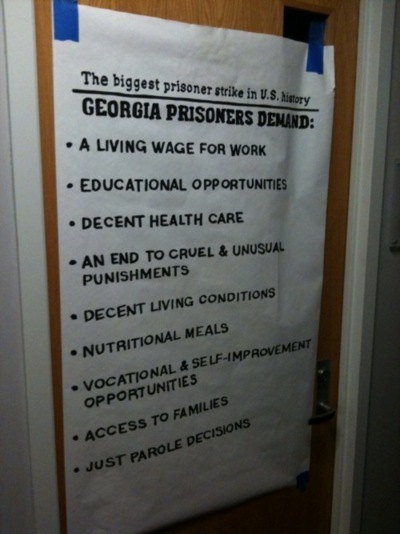 Visit Georgia Governor Sonny Perdue’s office in Washington, DC today and on the door you’ll find the nine demands motivating thousands of Georgia prisoners who [were] on strike. Prisoners there have been refusing to do slave labor for the State since the strike began on December 9 [and for nine days afterwards]. 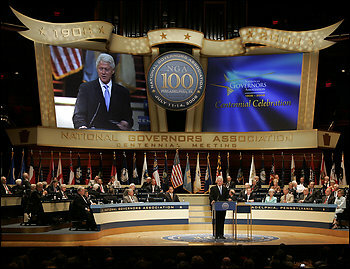 Drop by the National Governor’s Association (NGA) downstairs and you’ll find a bewildered bunch who’d rather pretend they have nothing to do with Perdue and his peers than acknowledge what the prisoners have brought to the fore: so many years after emancipation many US Governors today are effective slave masters over their states’ incarcerated population. “You’re in the wrong place to reach the governors,” Matt Malmo, Health and Human Services Director at the NGA told a group of DC locals who visited the office this morning in solidarity with the striking prisoners. Funny statement for an organization that calls itself, “The Collective Voice for the Nation’s Governors.” Malmo is not alone in his shamefully dismissive attitude towards the health and humanity of the prisoners. The Georgia Governor has yet to even acknowledge the strike and his Corrrections Department has outright denied that the strike is happening..
“We have a message for Sonny Perdue and all the governors. Slavery and injustice in the State of Georgia is an injustice to all of us,” explained one of the visitors as they presented the prisoner’s demands aloud and submitted a letter. Indeed, unpaid or penny-wage coerced labor programs exist in prisons across the country. Georgia pays most of its prison laborers nothing, while typical wages in other states range between 21 cents and $2 an hour. In recent memory an Illinois governor unilaterally declared a moratorium on the death penalty. We expect the same responsible use of gubernatorial authority to halt prison slavery and initiate just labor policies. 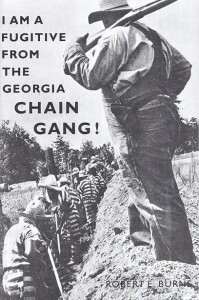 The Georgia Prisoners are demanding living wages for their work, an end to cruel and unusual punishment, decent health care and living conditions, nutritional meals, educational opportunities beyond the high school level, vocational and self-improvement opportunities, greater access to their families, and just parole decisions. Georgia’s prisons are at three times their intended capacity with one in thirteen adults locked up or in the system. While most prisoners work without compensation, they are charged $55 a month for once-weekly 15 minute phone access and 10% on all money transfers from family or friends into commissary accounts. Protest and non-cooperation with prison labor is typically punished with restrictions on basic rights like library access, rest time, and visitation. In the case of this strike, and this is largest prison strike in US history, retaliation by the state has been much harsher. Strikers with smuggled cell phones have reported violent retaliation. Corrections officers have assaulted prisoners, destroyed their property, turned off heat and hot water, restricted food, isolated suspected leaders, and cut prisoners off from their families. The Concerned Coalition to Respect Prisoners Rights, a formation representing the strikers from outside prison walls, is negotiating with the Department of Corrections to stop the repression of strikers and investigate current prison conditions. The Coalition includes family members of prisoners, like spokeswoman Elaine Brown, and groups like the NAACP and the Nation of Islam. As building security mobilized to eject the visitors to the governors’ offices today, the halls rang with the words to a great Solomon Burke song, “None of us are free if one of us are chained”. The visitors left singing and in high spirits, having sent a clear message to Sonny Perdue and the NGA: the prisoners are not alone in their righteous demands and their cry for abolition will be heard. The deafening stone of prison walls, the silencing blows of repression, and the transparent propaganda of a Department of Corrections in crisis, cannot contain the strikers’ message of rebellion and self-liberation. Solidarity actions are occurring across the country. Shine through the media blackout and join the movement for abolition. In solidarity with the Georgia prison strike. The following links give data concerning Ruffin v. Commonwealth of Virginia, Georgia Prison History, and Georgia State Constitutional proviso for prison slavery, shared ownership of the convict, and a free digital copy of the 1982 book Prison Slavery.